This is a large and comfortable apartment with great views and a very convenient quiet location close to the town centre. It is ideal for a family group or group of friends for a relaxed break or to explore the Highlands of Scotland. The beautiful Cow Hill Circuit which gives access directly to Glen Nevis is a ten minute walk away. Fort William is a popular centre for climbing, walking, scrambling, canoeing, mountain-biking, skiing, orienteering and other outdoor activities. There is also easy access to beautiful walking and cycling opportunities. This beautiful and historic apartment is ideally located within five minutes’ walk of the high street and is less than fifteen minutes’ walk from the railway station. 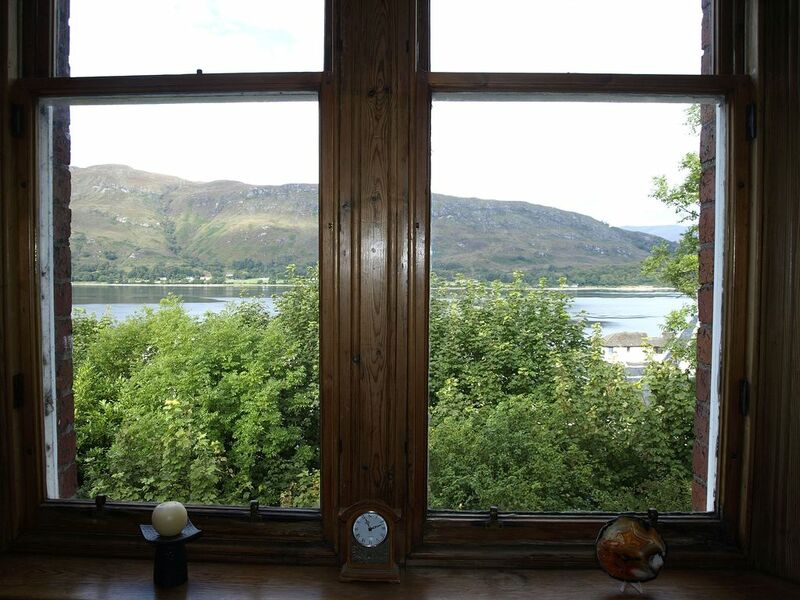 The apartment offers a lovely view over Loch Linnhe, enjoying a peaceful, elevated position. The apartment is split over levels 2 and 3 of a three story C 19th terraced building. It has its own private entrance with a flight of stairs. The accommodation comprises two or three double bedrooms one of which can also function as a second sitting room/ study. The kitchen is spacious and well equipped. Visitors will love the original oak panelling of this railway engineer’s house built in the 1890s. The large, comfortable main sitting room is equipped with a television. To enquire about your preferred dates please contact us today. I am a retired professional with a love of the Scottish Hills. My wife and I enjoy visiting and maintaining this lovely historic apartment. Interests music, photography, reading, walking and travelling. The walking is getting more restricted, sadly, but no less enjoyable. This property is ideally located in a quiet street above the High Street - close to shops and restaurants and with lovely views and walks. The accommodation is spacious and comfortable and has a homely feel to it. Fort William is the perfect base from which to explore the Scottish Highlands and is an international centre for walking, climbing, skiing, mountain biking and other outdoor activities. Free wi-fi is available most of the time but this is dependant on local broadband service and therefore, though confident, we cannot guarantee this. A fantastic homely property in the perfect location.Highly recommended! We had a great time in Fort William,and we just fell in love with Ambrose's home!It felt just like being at home.We really hope to go back ! Thanks for the lovely review Melissa and thanks for appreciating our home from home and leaving it in such good order. This property exceeded our expectations. Spacious but warm and cosy. Excellent location (we travelled by train and got about easily on public transport). We didn't want to leave - I'd book this place again in a heartbeat! Glad you like staying! You will be welcome to return any time! This accommodation has everything you need in the way of equipment. The locations is perfect and it is warm and comfortable. Margaret was an ideal guest. We hope she will return in the future. Great location and beautiful and large apt with fantastic views. Walking distance to town/restaurants. We had a fantastic week in Fort William and in this lovely apartment. It is well equipped with everything you need when self-catering is your choice. Ambrose was lovely and very helpful whenever needed. It was a perfekt stay and a wonderful week. We will be back. Susana was a pleasure to communicate with - so polite and understanding. Come again! Super und zentrumsnahe Wohnung mit Parkplatz. Wohnung gross und komfortabel. Ambrose hat sich bei Fragen gleich darum gekümmert und geantwortet.Wohnung ist mit allem ausgestattet was man so braucht. Ulrike was an ideal guest, helpful and understanding. She communicated well and respected the apartment. Close to golf, skiing, mountain biking, walking, climbing, canal cruises, loch cruises, steam train to Mallaig, Glenfinnan Viaduct. Prices include all linen, towels, electricity and heating. The apartment will be available from 4pm and must be vacated by 10am on day of departure. There will be an additional charge if the cleaners cannot gain access at 10 am £100 deposit on booking, balance to be paid 2 weeks before arrival. Sorry no pets. Non-Smoking No parties or loud music please two sets of keys are provided. Lost keys will be charged at £20 a set on departure all refuse and recycling must be removed and be put in the appropriate bin outside the front door on departure any spillages should be cleaned up and in the kitchen the floor, the surfaces and hob should be left reasonably clean in general the apartment should be left in the condition it was found and should need only a light clean throughout. If, as a result of your stay, additional deep cleaning is needed in preparation for the next guests an appropriate charge will be taken from your deposit.